Red-Blue Rili, one of Momma's offspring. I kind of like how it's just his tail and rostrum (nose area) that's red. 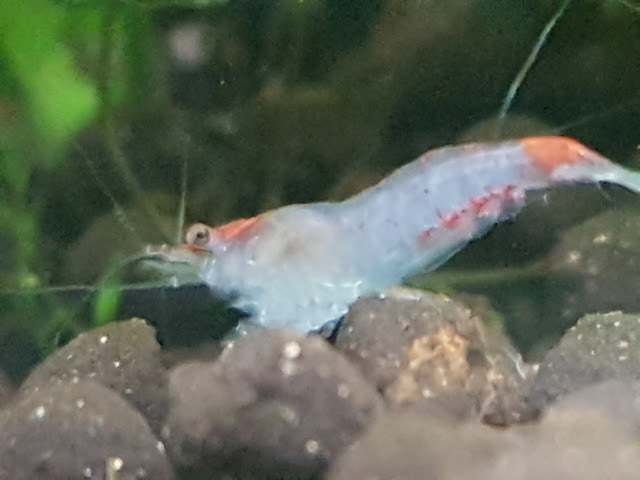 Today Momma Shrimp had the second batch of babies. We missed it again, and of course, we can't see any of the newborns but give it time and they will start to show up swimming around. Meanwhile the Red Cherry momma and Crystal Red momma are still expecting. The baby Blue Velvets are getting bigger ...and there are quite a few blue ones, so maybe Don wasn't the daddy, maybe the red/Rili/other odd colours are just random throwbacks to earlier genes in the breeding line, or maybe Don Cherry was the dad, and only some of them are red/other colours because Momma's genes are strong enough to breed mostly blues regardless of having a red dad... anyway, they are getting bigger, and there's another batch on the way any day now. Look, you can see the eyes! And.... there's a pregnant Crystal Red Shrimp in there now, so it's going to get crowded in the 10 gallon. 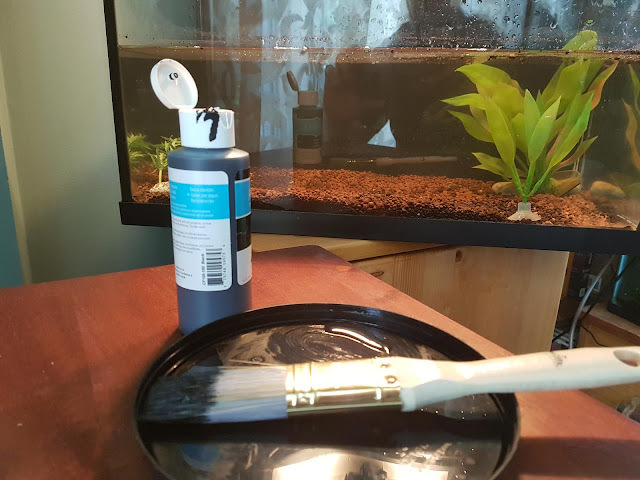 ...So I've decided to start a 16 Gallon tall tank where I'll move the adult blues and the CRS in a few weeks. (because the adults are easier to net and move) and over time the blue babies too to keep all the blues in one tank separate from the not so blue Neocaridinas.